Our City's first Auxiliary Police Force was formed in 1962 when the Federal Government developed the Emergency Measures Organization which was mandated to deal with natural disasters and local emergency conditions. At that time, the Auxiliary was under the direction of Deputy Chief Les Butcher and Gerald Axworthy, the Emergency Measures Coordinator. Seventy-five men were accepted to undertake a 14-week training course. The first commanding officer was Auxiliary Staff Sergeant Don Oxley. At this point training included map reading, rescue work, radiation detection and basic police skills. In 1965, the County of Brant Auxiliary Police E.M.O. was renamed, deleting E.M.O. from their official name. The name change took place in 1967 and the City of Brantford Auxiliary Police Force was brought under the direct responsibility of the City of Brantford Police Force. The Auxiliary Police Section is a component of the Brantford Police Service under the Operations Branch, reporting to the Inspector in charge of Operations. Auxiliary Inspector Lance Crump is the current officer in charge of the Auxiliary Police Section. The Brantford Auxiliary Police serve the City of Brantford by augmenting the strength of regular officers in the performance of their duties to the citizens of Brantford. We assist with traffic and crowd control at major events held at various times throughout the year. Our members also assists the regular service at community-oriented events on a year-round basis. The Auxiliary Police Section is on hand to assist in providing the staffing to coordinate search parties as well as emergency situations that may arise at any time. The Auxiliary Officer is also required to participate in three Special Duties per year. There are no classes for the months of July and August; however, any Beat and Patrol time would be appreciated. These requirements are mandatory after a recruit orientation course is successfully completed.
? Must produce satisfactory proof of having completed the requirements for the Ontario Secondary School Graduation Diploma, or equivalent. Equivalency can be obtained through your local Board of Education.
? Pass a screening process. Submit a covering letter of intent addressed to the Chief of Police and marked "Auxiliary Application"? along with a copy of your current resume and a completed application form. What does the screening/hiring process consist of? PLEASE KEEP THE SERVICE INFORMED OF ANY CHANGES TO YOUR NAME, ADDRESS OR PHONE NUMBER. 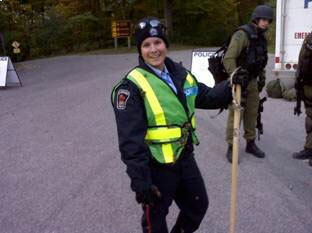 This is required in the event that the Brantford Police Service wishes to invite you to the next recruitment testing. The Brantford Police Service accepts applications throughout the year. Applications are kept on file for future hiring processes. We are proud of our Auxiliary Police Section and its members who continue to provide immeasurable assistance to officers of the Brantford Police Service and most importantly, the citizens of our City. Each year members of our Auxiliary Police Section dedicate over 4,500 hours. Their proud tradition of devotion and service to their community will continue well into the future.